Gourmet Collection Essentials Set is rated 5.0 out of 5 by 2. The AEG Gourmet Collection Essentials Set consists of three precision high performance pieces specially selected from the full range. The AEG Gourmet Collection cookware range is perfectly stackable to optimise space in your kitchen. 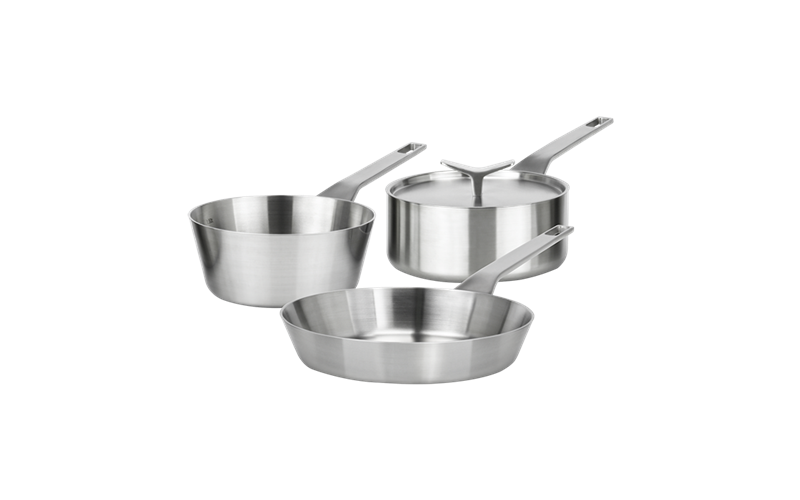 The stainless steel covers on the AEG Gourmet Collection create a seal on the pot, preventing evaporation of natural moisture from ingredients. The AEG Gourmet Collection can be safely washed in your dishwasher. Rated 5 out of 5 by Myles from European design at its best I have only had my Gourmet Collection essentials for a month and would like to revisit this review in another year. So far this cookware has epitomised the very best of European design and workmanship. Well worth the extra money they cost and we expect to hand these down in our family for several generations. If you are serious about your cooking and appreciate fine quality - this is the cookware or you! Not for the budget minded!